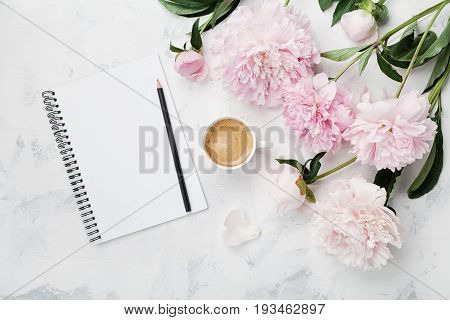 mug › Buy Poster of Morning coffee mug for breakfast empty notebook pencil and pink peony flowers on white stone table top view in flat lay style. Woman working desk. Poster of Morning coffee mug for breakfast empty notebook pencil and pink peony flowers on white stone table top view in flat lay style. Woman working desk.